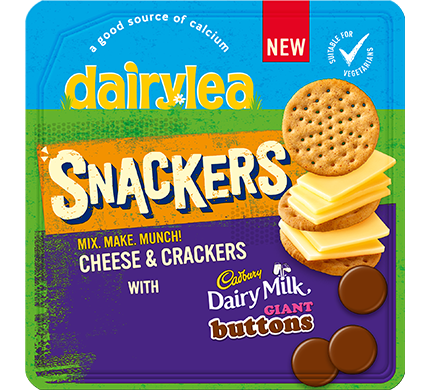 Introducing all new Dairylea Snackers. 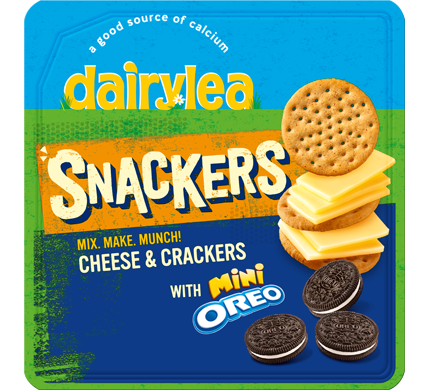 Enjoy our delicious Dairylea cheese & crackers now with yummy mini Oreos as a sweet treat for afterwards. 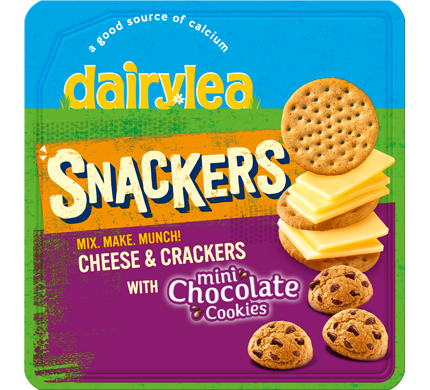 The perfect on-the-go all-round snack, as part of lunch, after school or when you’re out and about. Cheese Food: Skimmed milk (water, skimmed milk powder), cheese(75%), Emulsifying Salts (Sodium Citrate, Potassium Citrate), milk Protein,Butter, Whey Powder (from Milk), Vitamin D, Preservative (Sorbic Acid), Acidity Regulator (Citric Acid), Anti-Caking Agent (Sunflower Lecithin). Chocolate Flavour Biscuits with Filling: Wheat flour, sugar, vegetable oil (palm), fat-reduced cocoa powder (4.7%), Wheat starch, glucose-fructose syrup, raising agents (potassium hydrogen carbonate, ammonium hydrogen carbonate, sodium hydrogen carbonate), salt, emulsifiers (soya lecithin, sunflower lecithin), flavouring (vanillin).